These passages have been formative for us in our marriage, and therefore we’ve stressed them to our kids. We constantly talk about the picture of all of us being adopted by God. We stress that there is no primacy of our biological kids over our adopted kids, or vice versa. We are a family. Our family takes this seriously. After adopting in September of 2009, we have continued to talk about this with our kids. We’ve been involved in post-adoption groups. We’ve supported others in their adoptions through using our financial resources. We’ve donated goods to organizations that support the poor in our own communities, and discussed plans for increasing our personal involvement as our kids get older. While we discuss this theoretically, we also pray regularly for the biological mom (and dad) whose kids are now ours. This isn’t always popular with people that we talk about this. In some sense, it makes no sense to have feelings of love and sympathy for this woman who in many ways messed up our kids lives. We still deal daily with the effects of the neglect from their first year(s) of life and whatever drugs that their mom might have been on while she was pregnant. 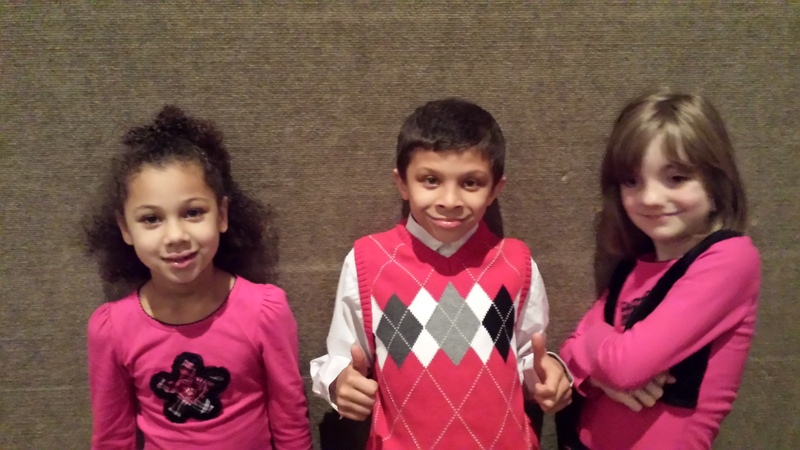 At various times, our three oldest have all expressed interest in someday adopting themselves. They’ve seen the vision. Of course, they know it isn’t easy. They know that all too well from their side. However, they also realize what it means to go from where they were to being adopted. I learn from them constantly about what it means to be adopted into God’s family, and what a messy blessing that is! A couple of years ago we had a surprise blessing of an unexpected pregnancy. All three of our older kids were stoked. They have loved having a new little brother. Recently, though, they have begun to ask when we can adopt again. They want to open up our home to another little boy or girl who needs to be set free (liberated!) from a dysfunctional family situation and encouraged to really develop and feel the favor of the God who created him or her in His own image. We are prayerfully considering how God may yet be moving in our lives to prepare us for what He has next. This much we know: our family is called to be involved in spreading His liberation. Yes, we as individuals have a call and a role to play in this, but God has not only called individuals. Jesus left His body, the Church, here to work together. In our families, and in the Family of God, we need to be working together as a community to care for the least of these in every way possible. How is your family called to care for the least, especially the orphans? 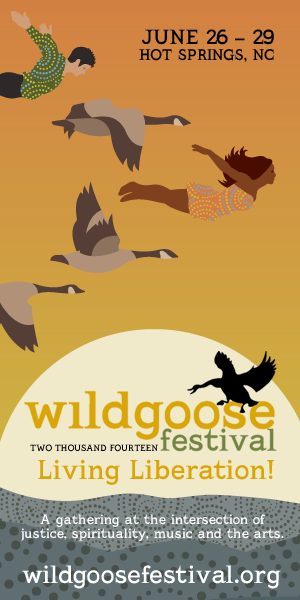 This blog is part of a blog tour in the build up to the Wild Goose Festival, 26-29 June in Hot Springs, NC (near Asheville). Please feel free to check them out, as they look to be set to have a great discussion about Living Liberation this summer through 10 tracks ranging from religion to sexuality. This post is emphasizing the Living Liberation as Family track, though I could easily have focused a similar discussion on the Living Liberation in Community or Practices for Liberation tracks, as well as a couple of others. Photo from the Red Letter Christians piece referenced in this post. I’m interested in the similarity between this speech and the reformers “re-baptizing” the Anabaptists by drowning them in the river. Sounds like torture of the infidels by bad baptism analogies isn’t all that new. Somehow I see Christ identifying with the tortured, not with Palin, the NRA, or the like. As I said here, I really do see Jesus identifying with the oppressed, even if the oppressed are terrorists who hate everything that they think Christ stands for. I see no evidence that Jesus ever looks at the oppressed and thinks, “well, they did have it coming” or anything like that. As such, I think that Christians should be standing with the oppressed here. While these conversations about Palin’s comments and condemnation of her views are needed, there has been a development that I’d like to spend more time on: a discussion of the beauty of baptism. Responding to Palin’s offensive comparison of baptism to torture1 is a necessary first step (and Tully and Gonzalez are helpful here), we then need to move to highlighting the beauty in baptism that she misses. 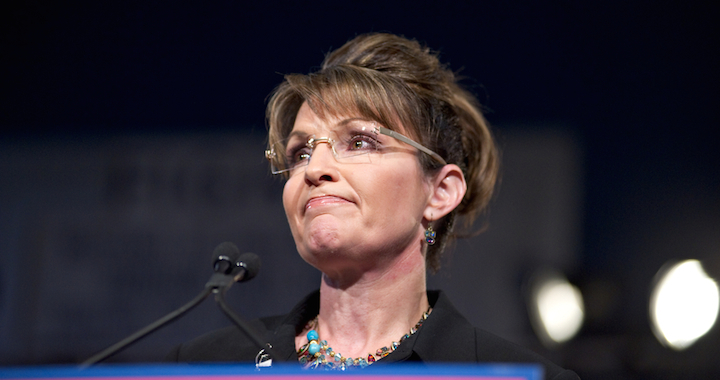 I suspect that Palin’s view ties baptism to personal salvation, rather than communal covenant. Since baptism is, in this view, about saving the baptized from hell, we might reasonably jump to the conclusion that if waterboarding can convince a terrorist of the error of their ways, they might be saved in some similar sort of fashion. Of course, this jumps past the saving power of Christ. Baptism is only a sign, and a communal one at that, of the power of Christ to bring the one outside the faith into the community of faith. It isn’t baptism that saves, and thus any “saving” nature in torture bears no resemblance to the inner work of the Spirit that we testify to in baptism. So, how do we look at ANZAC Day with Easter eyes? How do I take seriously that Jesus has turned the other cheek to us on the cross and in baptism empowers us to do likewise? Last weekend we celebrated our Lord’s triumph over the horror of violence on the cross, exposing all the ugliness and brokenness that is us, and all the grace, love and forgiveness that is our God. This weekend, lest we forget the horrors of war. Unfortunately, many instead will forget the horrors so many experienced in war and instead celebrate nationalism. What does war bring us? What does war expose in us? Christ gave us an alternative to war – love. God gave us love. And in that, God gave us strength. God did not command us to be doormats but to be peacemakers – to turn the other cheek in total defiance of systems than exploit and oppress, allowing us to overcome this exploitation and oppression not with violence but with love. In baptism, like Elisha, I have laid down my whole life. But this side of Easter, we can see that the God we surrender to conquers not with the sword of war but with the towel of service. So this ANZAC weekend, now as someone seeking to live out my baptism, not only do I pray for those whose lives have been and are being devastated by war, but I pray for those who are at war and who support wars, that they may see that God has shown us the most excellent way, through the love and compassion and grace shown at Calvary. I pray that this will indeed open our eyes to the brokenness and ugliness that we perpetrate when we are violent towards one another. I need your help church, to let this baptism, and this meal, be the way I live in the world. The way I love in the world. As we together witness to the grace that means no more blood needs to be shed. This is the beauty of baptism. May we all live into this blessed community that follows the example of Christ as our head. 1 Let’s be clear, waterboarding is torture. There is no doubt that it violates the Geneva Convention. No one can make a reasonable claim that it should be considered a viable option for treatment of prisoners, even terrorists. The fact that Palin supports it at all is horrific. Using baptism as an analogy is beyond ridiculous. My friend, and fellow MennoNerd, Drew Hart shared a link on Twitter this morning to a piece he wrote in August 2013. The piece speaks to the relationship of 400 years of discrimination from the origins of black slavery through the modern day. While the most recent incident mentioned in the piece is the Trayvon Martin case, his thoughts are just as valid as we look again at the response to the comment attributed to Donald Sterling, owner of the Los Angeles Clippers. Despite many previous rumors about his bigotry, and more than one lawsuit accusing him directly, many seemed shocked that he might say something like this. How can we still be shocked that there are racist white men in America? Just last week, a right-wing cattle rancher wondered if black’s might not be better off as slaves. The fact that we continue to act shocked and appalled, and to pretend that white racism is an isolated and rare occurrence, it strains credibility. Centuries of privilege gained on the backs of blacks do not quickly fade from the social systems. Just about a week ago I visited Valley Forge with my family. I asked my children to keep their eyes open for any Native, black, or other minority in any of the displays. It was hard work. Other than one display focused on the “melting pot” which mentioned Native Americans, slaves, Jews, women, and Catholics, there wasn’t much. Everything else showed a wide swath of white/European male faces. 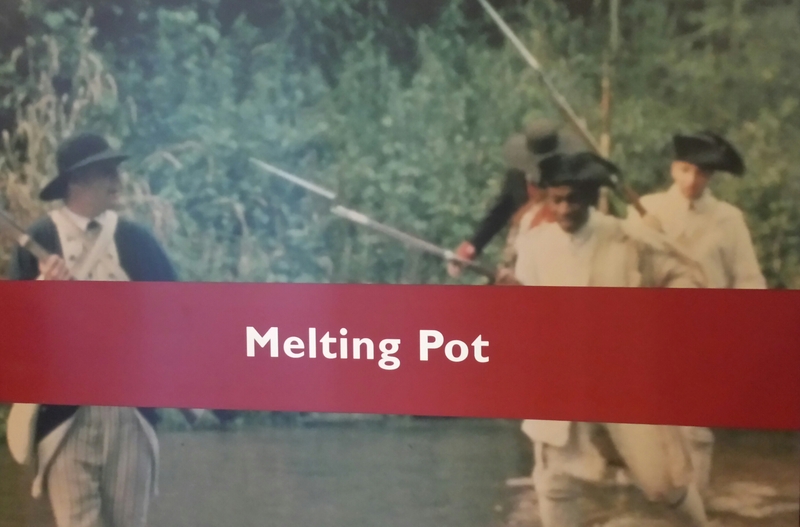 The video presented about the encampment barely mentioned some Philadelphia women who supported the army, but no mention of the “melting pot” of diversity that we often like to imagine. Our version of US history is essentially the white version. The sacrifices, usually involuntarily, of minorities is completely absent. Like clockwork our country cycles through event after event that sparks outrage over issues of race and racism in America. The responses to events like these are predictable, as many fall into their default positions, because people’s perceptions of what took place are equally shaped by race as much as the event itself that triggered the conversation. A slight majority of white Americans will deny and dismiss the outcry and experience of black Americans, claiming that it is emotionalism and an inability to deal with the facts. From their vantage point, only they are seeing things objectively. Their experience tells them that America is generally speaking a good, fair, and equal country. The continual outcry of black Americans, therefore, is a result of media manipulation and race card playing for sympathy. In the end, these White Americans apparently know and understand black experience better than black people themselves know it. Despite the fact that those who deny systemic racism most, are actually more likely to have less racially diverse networks than white Americans who also recognize the racial inequalities in America similar to African Americans (check out Divided by Faith). And there lies the problem. White intuition and experience (limited by homogeneous networks) is signifying one thing while black experience is claiming an alternative reality. What are people who participate in dominant society to do when their intuition and experience contradict the experiences of oppressed people? It is on that subject that we must gain some historical insights from before we can offer a constructive path forward. This call for counterintuitive solidarity and trusting the historically marginalized and oppressed perception above one’s own is not easy. But I believe that Jesus’ own emptying of himself and taking on slave humanity models for us The Way forward. Jesus’ own solidarity performance is a call to discipleship and imitation as a way of being in the world. It is the cure for privileged blinders that leaves people’s own vision impaired and unreliable. The Spirit is pulling all of us to see things “from below” because that is where God has chosen to move, work, and transform the world (1 Cor. 1:18-31). I encourage you to read all of Drew’s piece, as it can help those of us who are white to reset our own personal blinders to the effects of so many years of learned privilege and practiced ignorance of our position. For minorities, I hesitate to suggest what you might gain, since I have not walked in our shoes, but would suggest that understanding why whites often miss what should be so obvious to us is well explained in the piece. Drew has done and evenhanded job of fairly representing what you will too often have to deal with in dominant white culture. Hospitality. Today is the second contribution to the MennoNerds Synchro-Blog on Missional Spirituality. My topic for today is Hospitality. This is mentioned seven times in the New Testament in the NET version. (Acts 28.7, Romans 12.13, 1 Timothy 3.2, 1 Timothy 5.10, Titus 1.8, 1 Peter 4.9) One clear theme is that this trait is expected of those trusted with leadership. What does it mean? What doesn’t it mean? I look at hospitality as welcoming the “other” into our midst. There are two ways that we might do this that are not, in my view, hospitality. Highlighting these departures may help to illustrate what I think this term should mean to a follower of our Messiah, Jesus. One way that I have seen hospitality interpreted within the Church is to have an “open door” policy. That is, we say that others are certainly welcome, and we would never tell anyone to leave. However, we make no attempt to actually connect with any guests. We don’t ask to hear their story, or attempt to provide context for ours. If a visitor is to come, they are welcomed to fit into our style and practice, but we make it clear in subtle, and not so subtle, ways that we like who we are and how things work around here. If our style doesn’t work for you, we really don’t want to hear about it. We’ll be happy to simply suggest that maybe we aren’t the church for you, and you ought to try out Church X across town where the style, theology, ethnic makeup, or such might be more to your liking and you might fit in better. That is, of course, if we even notice that you aren’t happy here and have a conversation with you about why that might be. How this might seem to us to be hospitable is a mystery to me. Too often, however, this is what I’ve found among a large number of Christians. Let me provide an example or two from personal experience. I have a friend who is a gay Christian. He would like a church where the words of Christ, and scripture in general are taken seriously. He would also like to be valued as a person within the church he attends. While I disagree with him on some issues of biblical interpretation, he is my brother. Sadly, many of the churches he has contacted that value scripture and the example of Christ have taken the approach to hospitality mentioned here. You are “welcome” to come worship with us, but if you aren’t willing to change to “fit in”, you won’t be truly included as one of us. Another church I am familiar with has taken something of this approach with race. Looking around on a Sunday morning would provide a view of almost entirely white faces. In conversations with staff, a friend of mine was told that of course anyone, of any race, was welcome to worship at this church. However, no space was intentionally made to acknowledge the difference in experience of various racial groups in our culture. In hiring, promoting from within is was valued, and bringing in diverse staff voices to create an atmosphere of true welcome for racial minorities in this congregation didn’t seem to be on their radar. These churches would have said they were hospitable, but were they? It is my view that hospitality is better judged from the perspective of the other, and how they would feel, rather than how we can justify ourselves as hospitable, yet maintain our comfort. These churches don’t really make the “other” feel welcomed or valued. They may go away thinking that we were nice to them, but they won’t feel like they’ve been included. They will walk away with a clear sense of the “other-ness” to us, and unlikely to want to come back. The other extreme is to be so open as to simply accept anyone and anything as able to be included in our family. In this model, we don’t want to offend anyone else who might come into our Church, so we decide to water down any evidence of claim to unique belief or level of certainty. Some might call this “seeker centered”, but I’ve seen evidence of it outside of that particular context. Strong statements of belief will naturally divide, so this type of church tries to avoid that. Mission statements and sermons steer clear of exclusive claims to truth and end up sounding a lot like general “self-help” type advice. How does this look from the other? This is the other extreme that my gay Christian friend has found frustrating. Churches that will happily welcome him, and his partner, into their midst and include them in ministry proved to stand for very little. My friend lamented the lack of challenge he felt when attending these congregations. The messages didn’t challenge him to take the call of Christ seriously. He wasn’t challenged to be more like Christ, more loving, more sacrificial, more devoted to others. He wished for a church that was willing to take scripture seriously, challenge him to live his faith, and be willing to engage on the disagreements that made him “other” to them. Other churches I’ve seen like this can become great at welcoming non-Christians into their midst. They have a coffee-shop in the lobby. Everyone dresses down and comfortably. Things are set up not to present a hindrance to accepting Christ. None of this is bad, in itself. The problem is when this carries over to the message. The message may mention Jesus, but certainly not in a way that makes it seem like you’ll have to sacrifice anything should you choose to accept Him as savior. This phrase is telling, in itself. The emphasis is on what Christ can do for you, never what He might ask you to give up and do for the Kingdom of God. He’ll help you break bad habits, perhaps, but not to give up the habits you like. These churches would also claim to be hospitable. Are they? I’ve heard from friends who went to churches like these and left thinking “why bother?” If we just accommodate whatever they believe when they come in, what value do we add to their lives? Why take the time to come to church, other than to hang out with friends? Surely there is something we can add between sending them away without ever engaging with them and the opposite pole of welcoming them so openly that we add nothing of value to their lives. In the first case, they might get the impression that our Messiah might not be for them, since they are not one of us. In the second, they may get the impression that they don’t need our Messiah, because He doesn’t really say anything. A see the example of Christ as a model for us. Somehow he lived in a way that welcomed the “tax collectors and sinners” without ever compromising the difficulty of the message He was sharing and the sacrifice to which He called His followers. How can we look at this model and take a message for the Church? What we see is that Jesus clearly loved people, even those He disagreed with. No, He didn’t water down His message, and even told people at times not to come unless they had fully counted the cost. Somehow, despite this focus on the cost of joining the Kingdom effort, Jesus drew the “other” to Himself. Even those who disagreed couldn’t resist engaging Him in debate and conversation. While they were often shut down by Jesus, they kept coming back. What can we learn? We need to make space to hear the “other”. By default, we as hosts have the power and authority. A truly Christian approach makes space to say welcome by inviting the other to have space to share. Yes, we can offer background on who we are and have been, but it is more work (and more important) that we make space for the voices of others to be heard. This is risky business. We might actually learn from them, and find we need to change. This challenge is healthy, and I would claim necessary. True hospitality involves vulnerability. If we are not willing to listen and learn, we have not really opened up anything to our guest. However, this is not intended to say that we should predetermine that we will change to accommodate the other, regardless of view. We should suppose that we might have something to offer the other, just as they may have something to offer us. True hospitality is to offer the other the chance to teach and change us as we offer them the chance to be changed by us. Notice, these are offers. We must not use our power as host to insist that the other must change to accommodate to us, any more than we tell them that we will blindly accommodate them. This applies to all sorts of “others”, not just race or sexuality. Do we make space to listen to women, not just men? I’ve experienced too many churches where only male perspectives are given the stamp of authority. We as men need to learn from feminine perspectives if we are truly to understand the fullness of the image of God that is found in both male and female. Do we value the input of all generations? Some value the old at the expense of the young, while others reverse this. It ought to be true that anyone can share and teach the rest of us. I need to hear from the experienced voices in our congregation, but I also need to learn from younger adults, and even teens and young children. One of the times of greatest growth in my faith was when “leading” a youth small group of guys. The guys in my group taught me at least as much as I taught them. Receiving communion from one of these teens in our main worship service one Sunday was meaningful on many levels for me, as it reminded me of all this young man, and others in our group, had taught me before he even graduated from high school. Do we value those who are single? Those who are single, whether never married or single again because of divorce or death, are often given the impression that they are less valued in their singleness than they would be married. This can be subtle, but it is still insidious. I’ve seen churches that will not allow a single adult to minister to youth, as if their singleness makes them more likely to be tempted to inappropriate behavior. In a previous church I sat in on discussions of what we were looking for in a new pastor, and it was clearly assumed that the pastor would be male and married. This was never directly mentioned, but all of the comments were about what “his family” would expect of us and what we wanted him and his family to be like. Childless couples are often not much better off after the first few years of marriage or if they have made it clear they do not intend to have children. Many churches naturally favor families. It is as if we believe that a married pastor can speak to anyone, but a single adult can only minister to other singles. I believe this is a lie of the enemy to keep us from learning from and valuing these brothers and sisters. Do we who are the racial majority in this country realize how little we understand about being a minority in the US? We need to provide space to truly listen and learn from minority voices. Jesus was not white. He may have been in the majority in his area, but His race was not in power. The white, European Romans were in charge, and Jesus was a member of a group that was oppressed and controlled by others. How are we making room in our white churches to hear from racial minorities? Do we realize that those with differing views on sexuality may still read and value scripture? Are we willing to engage in dialog to understand them and their views? Too often, we are not. My own experience thankfully gave me the opportunity to do this with the friend I mentioned above. We say down to talk statistics one night (we both hold PhDs in the field), and the conversation somehow (I think it was God who helped us get there) turned to faith and his sexuality. He opened up about his experience and his struggles. I listened. I learned a lot. While we still disagree on many things with regard to faith and practice, he is my brother in the family of God, and I needed to hear from him. I’m sure we will talk again and I want to learn more from him. I pray that he will find a congregation which will allow him to learn from them and will be willing to learn from him. Do we welcome those with disabilities and insure that they have full access to participation in our community life? I’ve seen too many churches who use their old buildings as an excuse to allow those with physical disabilities to feel unvalued. Can we create ways for them to function fully in ministry and life within our church? What about mental disabilities? Are those with mental delays allowed to minister to others or simply looked at as someone to be ministered to? We ought to value and respect these people. Whether the disability is physical or mental, there is much those of us who are “abled” can and should learn from these brothers and sisters. When we allow our ability to prevent us from learning from others, we disable ourselves. Do we welcome those whose views on origins, predestination, peace, etc. make them an “other” in our church? In my church, my openness to evolutionary science is a minority view. While I am accepted and included, I do not bring it up much because I have felt at times like this would result in a fracture of my relationship with certain other members of the congregation. I’m sure that there are those who would disagree without a break in relationship, but I also know that is not universally true. I also know that while we as a church do not believe in predestination (also known as Calvinism or Reformed Theology), there are those who worship with us, and have for a long time, who would at least endorse parts of that theology. Peace theology can be a harder line to walk. How do you invite those in law enforcement or the military into your midst if your congregation feels compelled by the peace teaching of Christ? A tough question, but a necessary one. Hopefully, one that can be answered without changing or hiding the stance on issues of correct practice, but also without losing the ethic of love that would still make the “other” in this case feel welcomed and valued in spite of the difference in opinion about the choice of career. Other issues would similarly need to walk the line of balancing faithfulness to our beliefs with flexibility to work with those in the family of God with whom we disagree. One last area I will mention, but not discuss: Do those of us in churches where the congregation is mostly from the same minority group in the larger culture extend this hospitality to someone from the majority group joining them? I can’t speak to this much, since I don’t have the experience of being a minority or having attended such a church. I am looking forward to reading Christena Cleveland’s Disunity in Christ, in which I believe that she addresses this issue. It is near the top of my to-read list. I’ll stop there, though there are many others I could mention. I have already added more than the two or three examples I had planned, simply because it is so easy to think of people I’ve seen slighted by churches. In short, we do not want to be so rigid in our confidence in our theology that we exclude others with whom we differ. Nor do we desire to simply accept all with no call to commitment and acknowledgement of the cost and necessity of discipleship. We must walk the walk, but with love, so that we may attract those who are to us “other”, and build relationships. This must value the “other”, without devaluing ourselves. We must see the value in relationship with others outside our own church if the body of Christ is to be built up through the hospitality that we see modeled by our Lord. Have ideas that have helped your congregation practice hospitality? I’d love to hear them in the comments! Have experiences where your congregation has learned from doing something wrong? I’d love to hear that as well so we can learn from each other. For those who have been the “other”, where has the church gotten it right? Where have we gotten it wrong? Where do you resonate with my points above, or what have I missed or overstated? Comments from those who have not commented before will be delayed briefly until they are approved, but I assure you that I will only filter inappropriate/hateful comments and spam. Honest reflections on the question, even in disagreement with my themes, will be approved and appear as soon as I can clear them through. This article is part of a MennoNerds Synchro-Blog on Missional Spirituality for the month of February. MennoNerds is exploring through this event Spirituality through an Anabaptist lens and what it means concerning participation in the mission of God. My previous contribution on Family can be found here. Here is the obligatory love post on Valentines Day. It is a bit ironic that this day is named after a celibate man who was beheaded for his faith. I’ll leave that alone, and share this “love story” with a mathematical flare. If you make it through to the end, there is a math pun in it for you. Enjoy! For more serious posts, keep tracking with the cool stuff going on over at MennoNerds.com, especially with our Missional Spirituality series! I have clearly identified myself as an Anabaptist on this blog, most recently on Monday as I posted a blog in the MennoNerds Synchro-blog series on Missional Spirituality in the Anabaptist tradition. That might lead some to ask what an Anabaptist is. I found an interesting answer today from Scot McKnight at his Jesus Creed blog. He gives some background on the development of Anabaptism, and how the tradition has benefited even those outside this strand of Christianity. Then he gives three basic traits, which I’ll copy here in his words. He bases his work on Harold Bender’s The Anabaptist Vision. Surely there are others who would define Anabaptism differently, or at least highlight different aspects of the tradition. I think that this, at least for me, well defines the main aspects of Anabaptism. I have increasingly realized the importance of these concepts in Scripture, and thus they have become crucial to my own walk with God. Fellow Anabaptists, which do you think is most important to the tradition? What would you add to McKnight’s list? Do you think one of his three are not as important to the tradition as he claims? To those from outside the Anabaptist stream, what do you think of these? How are these represented in your faith tradition? For things that are not in your tradition, why do you think that your tradition doesn’t value these? Family. What comes to mind when you hear this word and contemplate what it means? For me, as I assume is true with most of my readers, there are multiple layers of meaning. Of course, I first think of my wife and our kids. I then think back and remember growing up with my parents and my sister. My mind also expands to my extended family: aunts, uncles, cousins, grandparents, etc. Now this includes in-laws, both my wife’s family and my sister’s in-laws. In 2009 we added another layer to this mental image. We (my wife, daughter Abby, and myself) adopted two children into our family. For us, this has gone further than “just” adding two more children. Our children came to live with us in the summer of 2008 as foster children. During the 15 months that they lived with us, we grew to know some members of their birth family. This relationship has continued, and now means that we include some of these members as a part of our image of family. Legally, they are not related to us, or our kids. Biologically and emotionally, they are a part of the story that led two of our children into our home. I cannot imagine the process without them, and all that they added in helping us adjust and understand the two young children we were suddenly trying to parent. Ironically, I could not have imagined life with a third set of “grandparents” for our kids before this process. We did not go into the adoption process planning to long-term foster first, or hoping for the added complexity of dealing with a birth-family. Still, that complexity has led to real beauty as well. There is another layer to family, our family of close friends. Our best friends often take on something of true brother-hood (or sister-hood) in our lives. I have several friends who I look at as true brothers and sisters. I don’t mean this simply in the sense that we sometimes use as Christians (more on that later), but in the sense that I know that they are there for me no matter what the situation and whether we’ve just had an argument about some area of disagreement. I know full well that some of my friends would drop everything to be there for my family if there were a need, just as my parents and in-laws would be. In the larger context of the Church, we are supposed to be just that kind of family. In fact, whether we feel the connection or not, we are brothers and sisters. In a story captured by Matthew, Mark, and Luke, Jesus radically redefines His own family. His mother and brothers come to see Him but cannot get to Him. He is informed that they are present and looking to speak with Him. He turns to those within the sound of His voice and says “My mother and my brothers are those who hear the word of God and do it.” (using Luke’s gospel from the NET translation) Here Jesus radically redefines a family based on faith, not blood; a family based on the Spirit, not the flesh. This idea of a “family of faith” is also found in the epistles. Paul writes to the Galatians: “So then, whenever we have an opportunity, let us do good to all people, and especially to those who belong to the family of faith.” (Galatians 6.10 NET) So we do good to all, but “especially” those in the broad Church. Also, Peter writes: “Honor all people, love the family of believers, fear God, honor the king.” (1 Peter 2:17 NET) Both of these apostles use the term family to refer to believers, or those in the faith. This predates denominations and the schism common in the time of the reformation and beyond, but I think that we should read this to include all those who call Jesus their Messiah and King. How does this impact life as a follower of Jesus? I think it has some major implications that are often overlooked. I have explored some of these themes before, but not specifically with this motivation. I think it comes down to a question of allegiance and who we are most bound to support and defend. If my primary focus is on family based on biology, I will likely align with nations based on geography and ethnicity. This is so common in many Evangelical circles that we see a close alignment of groups like the Religious Right, the Moral Majority and the like. The mainline churches tend to align with the left side of the political divide. Both sides have bought into the lie, I believe, that family is defined for us the way the Powers would want us to define it: according to the flesh or the physical world. Our Messiah calls us to a different, higher, definition. We are to define our family according to the Spirit. This means that a believer in China, Burkina Faso, France, or Brazil is a member of my family in a way that is more real than anyone outside the faith who lives on my block. Thus, when I see my earthly country of residence making decisions that hurt my brothers or sisters in other parts of this world, I should be grieved. When the United States bombs civilians in a Muslim country, and claims to be a Christian nation, I grieve. This gives the impression that Jesus would bomb them, and makes life so much worse for whatever Christians may be present in that country. The plight of Christians in Iraq since the war that removed Saddam Hussein from power has been horrific. My family members in Iraq have suffered greatly because of the actions of the US. Which side should I support? For too many Christians down through history, this question has been easy to answer, but for the wrong reasons. We have assumed that since our country is largely populated by people who identify themselves with Jesus, God must be on the side of our country and thus our actions are probably right. There may be some sentiment to feel bad for the Christians in Iraq, and to offer them asylum within our borders, but there is not much real remorse for the effects on these sisters and brothers of ours. I submit that this is a sign of not being aligned with our King. While I applaud the good that the US, or any other country, may do in the name of Jesus, I cannot blindly endorse any activity. The struggle between nations is not my primary focus. These struggles, and the debates among Christians in how to wage them, often miss the real point. The true battle is between the Kingdom of God and the kingdoms of this world which scripture refers to as the Powers, or principalities of the air. We are a part of a Kingdom based on family, the Kingdom of God. All of the members are family, sisters and brothers, mothers and fathers, sons and daughters. This is the image to which we are called. I pray that as we follow Christ in His self-sacrificial love and refusal to stoop to the use of violence which comes so easily to us, we will rediscover how to be family with all of those fellow believers. This has other implications on a more interpersonal level. Within any family there will likely be squabbles. Unfortunately, those sometimes happen in public. While we can at times air our differences, we should be careful of our tone when we do this. I may disagree publicly with you, but I must be careful to make sure that anyone who hears about the difference, also knows that I still consider you family. I am an Anabaptist. If you follow Christ and disagree, I think you are wrong, but you are still a member of my family. I disagree strongly with much of Calvinist theology on many points, but still count Calvinists as members of my family. I’m not Catholic, but if you are, you are still my brother or sister. Hearing and doing the will of God is the key, according to Jesus. If you are endeavoring to follow the way of our Messiah as best you can understand right now, I count you as one of “mine”. We are a part of each other, like it or not. Now, let’s be family together and start working together to accomplish our Father’s mission. Along the way we’ll talk, and probably disagree, but together we are God’s workers to change the world and awaken people to His love for them and invite them into the family. Coming full circle, that’s what God’s family is all about. Adoption into the family, just as it was for our family, is life changing. There is no such thing as an adoption where no one is changed. Our adoption changed life for my wife, for our biological daughter, and for me. It also changed life for two precious children who were without parents to guide them and help them grow. Adoption is complicated, messy, and life-altering. It is also life-giving, both to the adopted and the adopters. This is especially true as we recall that we are also adopted. We love because He first loved us. For more on our adoption and my thoughts about adoption, check out posts tagged foster/adoption or categorized as adoption. For my previous discussions of allegiance, you can check out this post. This article is part of a MennoNerds Synchro-Blog on Missional Spirituality for the month of February. MennoNerds is exploring through this event Spirituality through an Anabaptist lens and what it means concerning participation in the mission of God.